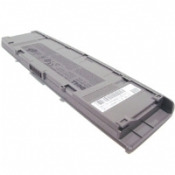 Dell Latitude C400 Battery Li ion Rechargeable Li-ion Battery (Rating: 11.1V - 3600 mAh - 48 Whr). The Dell P/N is 4E368, 4E369, 00J256, 312-4609 or equivalent. This battery fits Latitude C400 notebooks only. The Dell Smart Lithium-Ion Primary Battery has internal circuit board with chips that allow it to communicate with the notebook to monitor battery performance, output voltage and temperature. It also gives the notebook much more accurate 'fuel gauge' capability to determine how much battery runtime is left before the next recharge is required.